If you are considering Invisalign, there are some things to learn before taking the leap. Most people understand that Invisalign has cosmetic benefits but don’t know about the many health benefits the aligners have to offer. Invisalign allows your oral health to reflect your beautiful new smile. When you have misaligned teeth, you are open to a greater risk of gum disease and other damage to your gums. It is more difficult to remove plaque and bacteria during brushing and flossing, which can potentially lead to inflamed gums, soft tissue damage, receding gums and pockets between teeth and gums. With Invisalign, you can align your smile correctly, allowing you to better practice oral hygiene. Misaligned teeth create pressure and stress between the teeth and the jawbone. This can make them more sensitive to the cold, susceptible to chipping or cracking and more likely to experience tooth loss. This pressure can also cause indentations at the gum line as well as jaw pain and even headaches. With a straighter, stronger smile from Invisalign, you can avoid these issues. With weaker teeth and gums from a misaligned smile, more than just oral hygiene can suffer. When people think about oral hygiene, they often think the worst case scenario is a few cavities or a little tooth pain. In reality, oral hygiene greatly affects your overall health. Poor gum health and weak, misaligned teeth make you more susceptible to gum infections. Gum infections increase the risk of heart disease, stroke, lung disease, pregnancy complications and even Alzheimer’s disease. Oral health needs to be viewed through a holistic lens, where it is directly connected to the wellbeing of your entire body. Another surprising fact about straightening your teeth with Invisalign is the digestive benefits you will receive. Misaligned teeth make it more difficult to chew properly, which is essential to digestive health. When your food isn’t fully broken down by chewing, it negatively impacts the absorption of nutrients in the body. Proper nutrition is imperative to holistic health and Invisalign can help you get the most out of your food. You may also want to seek out a dentist that offers Acceledent, in addition to Invisalign. This FDA approved medical device can be used just 20 minutes a day, providing gentle vibrations that encourage teeth to move. Using Acceledent in conjunction with Invisalign could decrease treatment time by as much as 50%, giving you the beautiful, straight smile you want in half the time. When you go to your dentist for Invisalign aligners, they usually give an estimate of how long the entire process will be. Fortunately, you will not only be able to finish your treatment way quicker than using metal braces but you will also see initial results sooner! Most dental patients start seeing visible results within only a few months. The best part – you can clearly see the improvement in your smile, as it isn’t covered with unsightly metal braces. When traditional, metal braces are removed, there is a possibility of tooth discoloration. The face of your tooth underneath the brace isn’t exposed like the rest of the tooth, so it can end up being a different color when the braces come off. 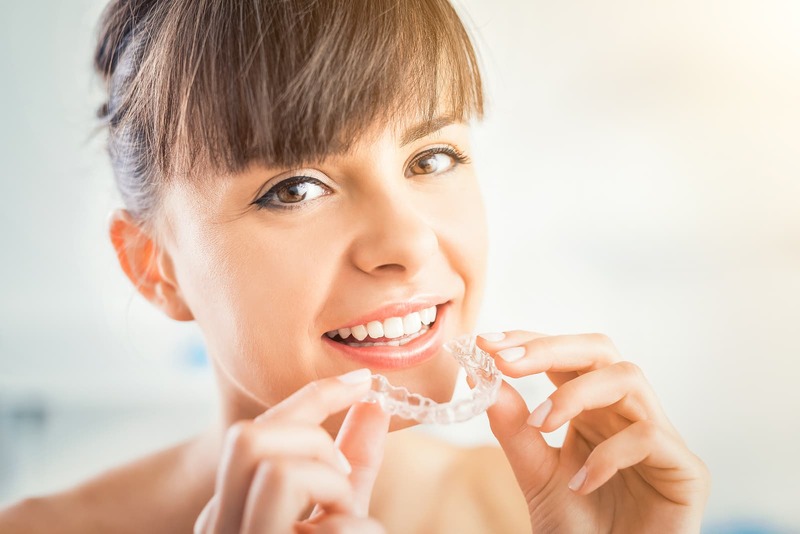 This simply isn’t an issue with Invisalign, in fact, you can even use at-home or professional teeth whitening treatments while using the aligners. No matter how much they could benefit from braces, many adults completely give up on straightening their teeth due to their age. They can get embarrassed thinking that braces are only for younger people. All of these concerns go out the window with Invisalign. The aligners are clear and barely noticable, if at all. You don’t have to feel insecure or embarrassed while treating yourself to a beautiful smile. When you brush teeth with metal braces, you need to get above, below and in-between them and flossing requires special techniques which can be quite frustrating. Sometimes metal braces even require patients to connect their jaw with rubber bands. With Invisalign, simply take out your aligners in order to brush and floss like anyone else. If you are looking to obtain a perfect smile with Invisalign, you will need a highly-qualified dentist. Holistic Dental Center offers exceptional holistic and biological dentistry with surgical expertise in a friendly, home-like environment. We can give you a beautiful smile with Invisalign and so much more. For the very best in holistic dentistry, contact us today.